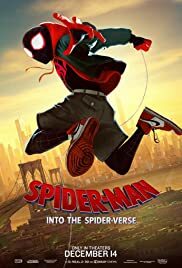 Here is “Spider-Man: Into the Spider-Verse” trailer with English and French subtitles. – Miles?! You’ve gotta go. – Yeah? If you want me to drive you, we’ve got to go now. – Personal chauffeur going once. – No Dad, I’ll walk. It’s okay. Seriously, dad. Walking would have been fine. Breaking news: Spider-Man saves the day again. Dad speedup! Speed-up! I know these kids. – Hey Miles! Have you been arrested?! – Guys, don’t cops run red lights? My name is Miles Morales. – You’re like me. – How? You want to know what happened to you. I can teach you to be Spider-Man. I love these burgers, so delicious. It’s one of the best burgers I’ve ever had. You have money, right? I’m not very liquid right now. I think you’re gonna be a bad teacher. How am I supposed to save the whole world? don’t do it like me. I see this spark in you. It’s amazing! Whatever you choose to do, you’ll be great. – I love you, Miles. – Yeah, I know, dad. – You’ve got to say, “I love you back.” – Dad, are you serious? – You’re dropping me… – “I love you, dad”. – Time to swing, just like I told you. – When did you teach me that? I didn’t. It’s a little joke for team building. – Hey, guys. – Okay, who are you? – How many spider-people are there? – Save it for Comic-Con. – What’s Comic-Con? – Let’s go!